Mahindra has just launched the Verito Vibe notchback at a starting price of Rs. 5.63 lakh. It is available in three variants, all diesel powered and comes in seven colours. 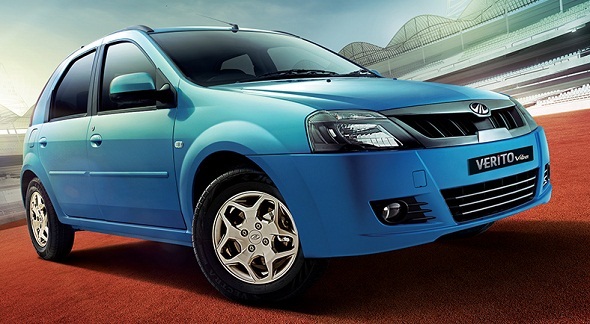 The Mahindra Verito Vibe is not really a hatchback and neither is it a proper sedan. There is one big problem with shortening a sedan into a compact sedan – and that is in most cases you end up with something that doesn’t look good or proportionate. And Mahindra has the same issue with the design of the Verito Vibe. By keeping the dimensions and design of the car identical up to the C-pillar, to save on development costs, Mahindra has ended up with rear styling for the Verito Vibe that looks far from pretty. The tail-lamps look out of proportion with the rest of the car and occupy the entire length of the C-pillar. The car looks like a hatchback in profile, but in fact is a sedan or notchback – the boot lid is hinged below the rear glass which is fixed – again something born out of building a car to a very tight budget, as redesigning body panels extensively would have added to the cost. The big advantage the Mahindra Verito Vibe has compared to other compact sedans in its segment is that it is easily the most spacious car in its class, as the cabin space is identical to the full-size Verito – a car whose USP was space and hence is quite popular with commercial cab operators. The rear seat of the Verito Vibe is wide – wider than most compact sedans and can seat three abreast comfortably. Boot space, however, has been compromised. 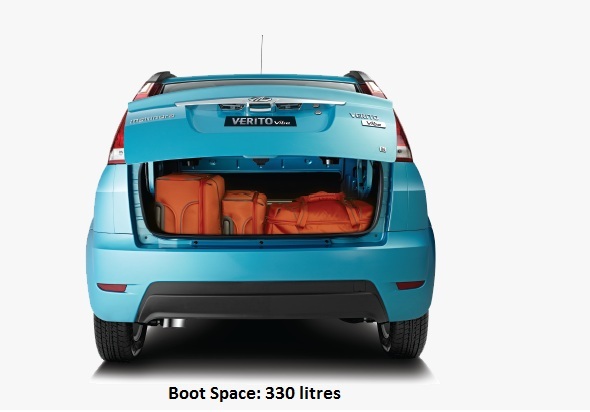 The huge 510 litre boot of the Verito has been axed to just 330 litres. That is still larger than the Maruti Dzire, which is at just 316 litres, but is nowhere close to the Honda Amaze which has a 400 litre boot. 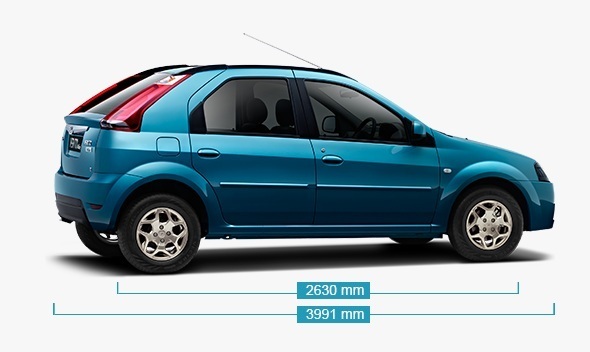 It is also lower than the Tata Indigo eCS, the first compact sedan in India, which has 380 litres of boot space. The Mahindra Verito Vibe is not particularly loaded with features, but it at the price it is being offered it is good value for money! The top-end D6 variant of the Verito Vibe gets a single driver’s airbag, ABS, EBD, power adjustable mirrors, height adjustable seat and double-DIN music system with USB and Aux-in. It doesn’t offer Bluetooth though! If you look at its price point of Rs. 6.49 lakh, and you compare it with the Maruti Dzire, it looks like good value for money as the latter is priced at Rs. 7.50 lakh. It is even good value for money when compared with the Maruti Swift premium hatchback at Rs. 6.87 lakh. The only car that could give it a challenge are premium hatchbacks such as the Ford Figo Titanium diesel and the Chevrolet Sail U-Va (LS-ABS variant), which have equal or more features than the Verito Vibe. 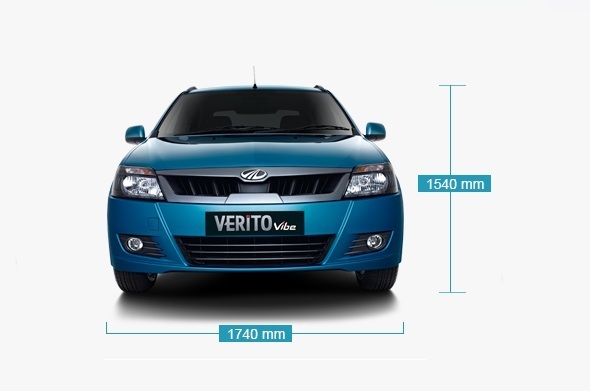 The only convincing bit then is the little extra space for passengers and luggage that you get with the Verito Vibe. Looks play a very important role in car selection, especially for those looking for an entry-level sedan in place of a premium hatchback. Therefore, trying to push the Mahindra Verito Vibe as a notchback akin to an entry sedan wouldn’t work for it. However, we see this car being extremely good value with the commercial cab operators – as the Verito Vibe is about Rs. 70,000 cheaper than the full-size Verito sedan. But again, it will have a tough time trying to compete with the Tata Indigo eCS, which offers more luggage space and is a favourite with cab operators at the moment. Private buyers would probably look at more aesthetically designed offerings in the market such as the Honda Amaze or even the Maruti Dzire. 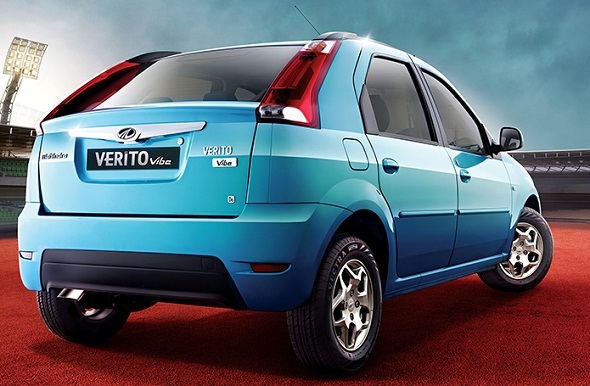 Also read: Mahindra Verito voted better looking that Toyota Etios!